The Vamo is an extremely popular “tube mod” that has transitioned through various phases (ie: Vamo V1, V2, V3, etc.) – all the way up to the powerful Vamo V9. 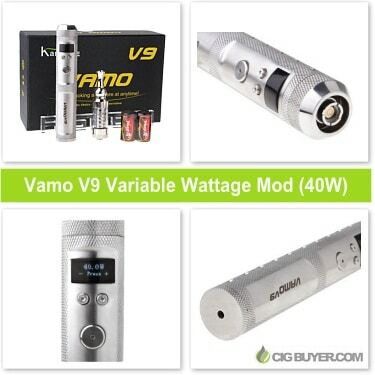 Last year we reviewed the Vamo V5 (15W), but the latest version provides up to 40W of power! The Vamo V9 Mod has an updated look with many of the same great features as it’s predecessors (OLED display, battery and resistance check, puff counter, etc. ), offering even more power and functionality. * Free worldwide shipping applies. No special coupon codes are required.